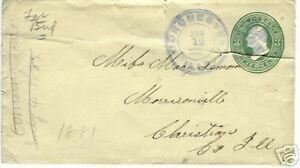 Details about 1881 three cents CANCELED STAMP LETTER COVER ILLS. (CANCEL IS. DOROHESTER ILLS. JAN 12 1881. fee's as the item sale ). IF AFTER YOU RECEIVE YOUR ITEM, AND YOU DON'T FEEL IT'S WHAT YOU WANTED, EVEN IF YOU FIND YOU JUST DON'T WANT IT FOR ANY REASON.